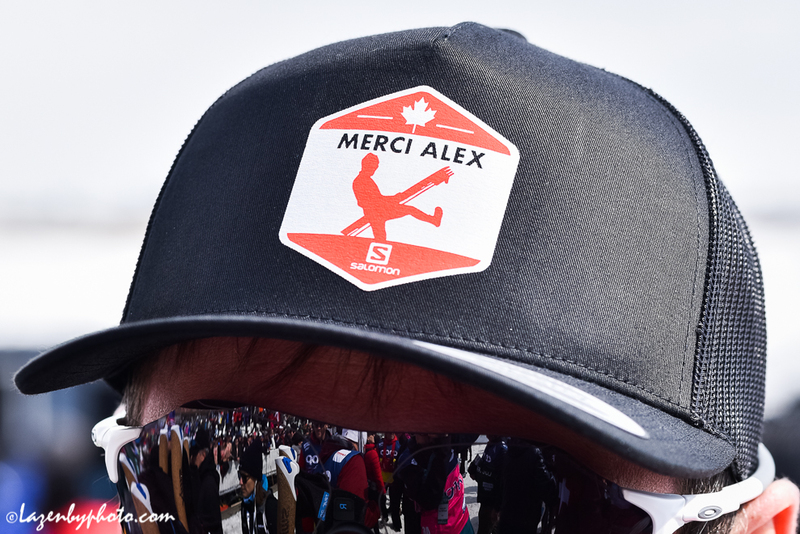 Alex Harvey finished his career racing for Canada with a bang today in Québec City, Canada. 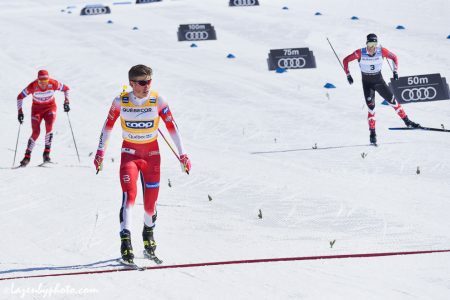 Harvey placed second to Norway’s Johannes Høsflot Klæbo in today’s 15-kilometer freestyle pursuit. It was Harvey’s second podium in as many races as he can now claim a perfect ending to his career. 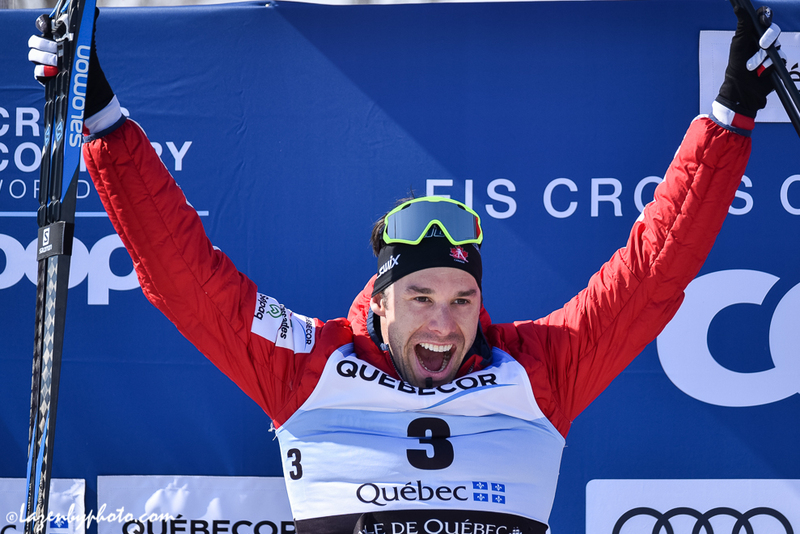 Another solid ending went to Klæbo, who with his win today earned the overall World Cup title. Although the point differential lent an air of intrigue to the racing as Klæbo and Alexander Bolshunov of Russia were fighting for the overall title today, Klæbo’s knack for theater and endurance left nothing to doubt. Bolshunov placed third on the day and second in the overall standings. Klæbo’s sentiments weren’t guaranteed with Bolshunov as the chaser. Klæbo started the pursuit 52 seconds ahead of Bolshunov and Harvey. Because of this, Klæbo skied the first half of the race alone. But, in a chase lead by Bolshunov, Harvey and Bolshunov continued to make up time on the Norwegian. Just before the 8k mark, Bolshunov and Harvey came into eyesight of Klæbo and by the 8.2 checkpoint, the three skiers were skiing together. They were locked as a trio until near the finish. Bolshunov lead the second half of the race, with Harvey in second and Klæbo sitting in behind. But during the final climb, Klæbo found a last bit of energy and attacked, pulling ahead of Bolshunov and Harvey. He kept this lead to the finish, ending the race +2.8 seconds ahead of Harvey. Bolshunov seemed to have second place in the bag when he and Harvey came around the corner into the finishing stretch. Harvey came from behind with an inspiring final push and managed to overtake Bolshunov and grab second place. Today’s podium was the 28th and final podium of Harvey’s World Cup Career as he is set to retire at the end of this season. Bolshunov is ending his 2018/2-19 season with 10 podiums, five of which were wins. All smiles at the end of the season. 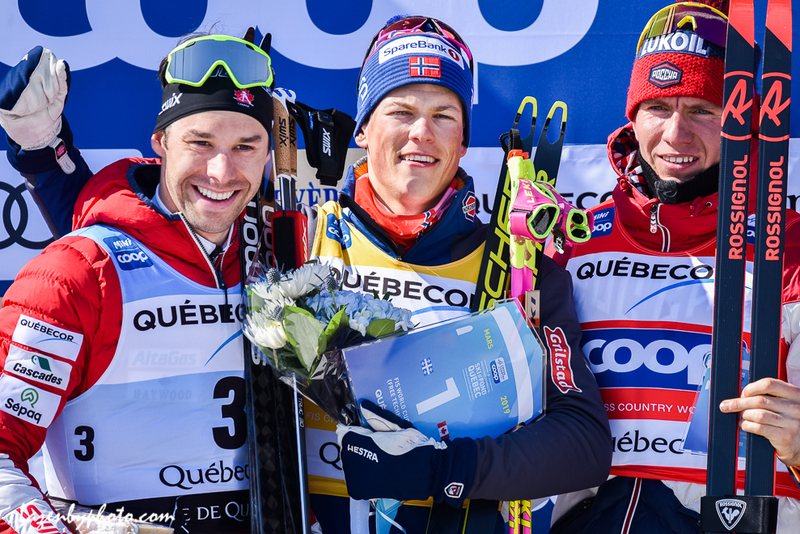 From left to right, Alex Harvey (CAN) was 2rd, Johannes Høsflot Klæbo (NOR) was 1st and Alexander Bolshunov (RUS) was 3rd. Yet Klæbo qualified his statements to note that he harbors no deep-seated resent for the Russians. 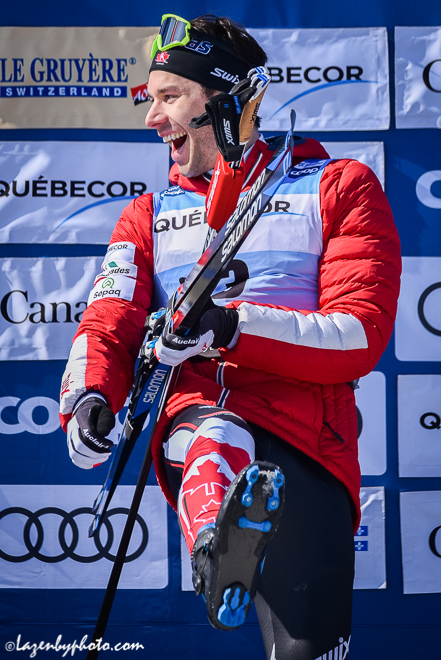 Harvey spoke to FasterSkier about his season and ending his career. The chase pack, consisting of Norwegians and Italians fought hard to gain time of the leaders, but in the end, the leader of the chase pack, Francesco De Fabiani of Italy, finished +1:13.3 behind Klæbo. Norway finished the day with six men in the top ten and Italy with two. Sjur Røthe was third in the Overall World Cup results. In today’s race, he was 10th, but he has won three World Cups and was second in a fourth race. Six Norwegian athletes finished in the top 10 of the season-long overall standings. De Fabiani and his teammate Federico Pellegrino were seventh and eighth respectively. U.S. 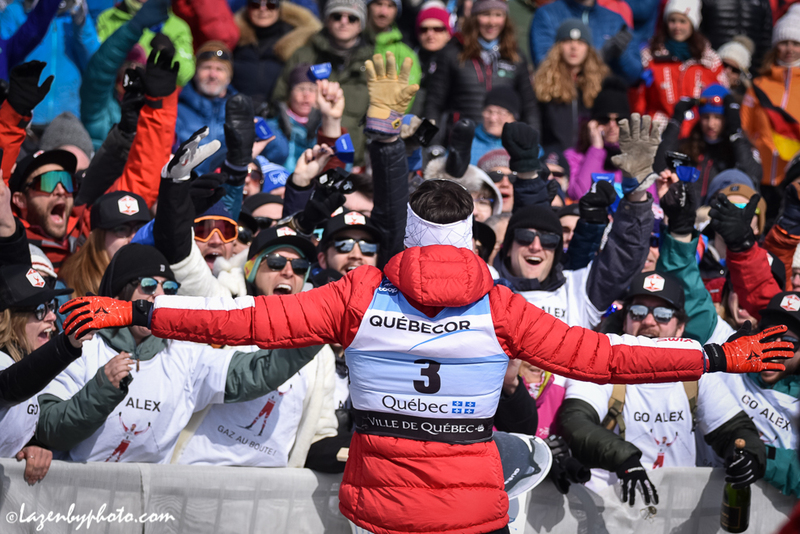 Ski Team member Erik Bjornsen was the next North American to finish, placing 20th. This is Bjornsen’s fifth top-20 this season. Simi Hamilton placed 26th. Hamilton blasted the course to ski the third fastest time of day. Harvey and Bolshunov, wh0 turboed to catch Klæbo, were first and second respectively. Hamilton’s time of 28:48.9 was 33.5 seconds behind Harvey’s who skied the fastest time of day. British skier Andrew Young marked the fourth fastest time, 0.1 seconds slower than Hamilton. 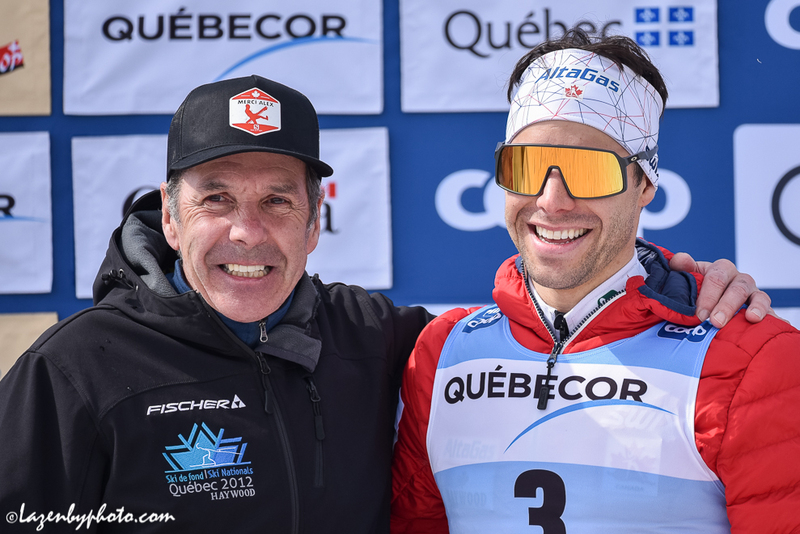 Kevin Bolger and Scott Patterson skied together during today’s race, they finished 44th and 45th respectively. Also racing for the US were David Norris who was 55th, Logan Hanneman who was 65th and Ben Saxton who was 69th. The US started a number of athletes who are new to the World Cup circuit. 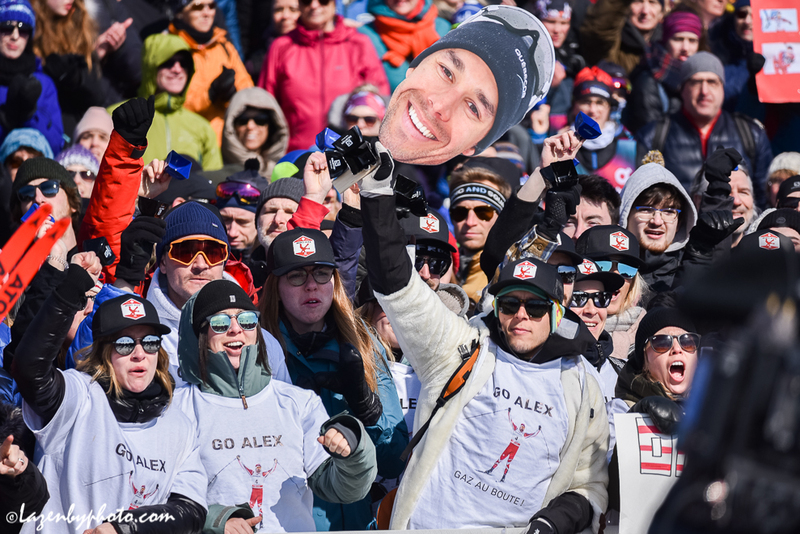 The was the first World Cup weekend for Gus Schumacher who placed 52nd, Ben Ogden who placed 66th, and Peter Holmes who placed 70th. The US Super Finals begin on March 28th in Presque Isle, Maine. These are the final races of the season for the U.S Ski Team.